For other uses, see Wing (disambiguation) and Wings (disambiguation). 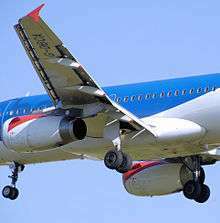 The wing of a landing BMI Airbus A319-100. The slats at its leading edge and the flaps at its trailing edge are extended. Flaps (green) are used in various configurations to increase the wing area and to increase the lift. In conjunction with spoilers (red), flaps maximize drag and minimize lift during the landing roll. Internal mechanical construction of a generic monospar wing. Black = solid, red = tube used for the spar, green = foam, wood, honeycomb, or sheet metal used for the ribs. The leading edge gives torsional stiffness. The trailing edge can either have a flexible skin, which does not break under wing bending (birdlike,) or have a stiff skin (made of carbon fiber, aluminum alloy, or titanium, aircraft-like), which is prevented from buckling by span-wise "stringers." 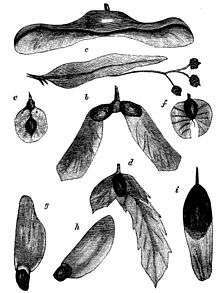 Various trees such as maples, and the Alsomitra macrocarpa have winged seeds that enable them to disperse, some autorotating as they fall, often catching the autumn wind as they do so. A wing is a type of fin with a surface that produces aerodynamic forces facilitating movement through air and other gases, or water and other liquids. As such, wings have an airfoil shape, a streamlined cross-sectional shape producing lift. The word "wing" from the Old Norse vængr for many centuries referred mainly to the foremost limbs of birds (in addition to the architectural aisle.) 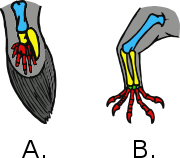 But in recent centuries the word's meaning has extended to include lift producing appendages of insects, bats, pterosaurs, boomerangs, some sail boats and aircraft, or the inverted airfoil on a race car that generates a downward force to increase traction. Various species of penguins and other flighted or flightless water birds such as auks, cormorants, guillemots, shearwaters, eider and scoter ducks and diving petrels are avid swimmers, and use their wings to propel through water. A wing's aerodynamic quality is expressed as its lift-to-drag ratio. The lift a wing generates at a given speed and angle of attack can be one to two orders of magnitude greater than the total drag on the wing. A high lift-to-drag ratio requires a significantly smaller thrust to propel the wings through the air at sufficient lift. The design and analysis of the wings of aircraft is one of the principal applications of the science of aerodynamics, which is a branch of fluid mechanics. The properties of the airflow around any moving object can - in principle - be found by solving the Navier-Stokes equations of fluid dynamics. However, except for simple geometries these equations are notoriously difficult to solve. Fortunately, simpler explanations can be described. For a wing to produce "lift", it must be oriented at a suitable angle of attack relative to the flow of air past the wing. When this occurs the wing deflects the airflow downwards, "turning" the air as it passes the wing. Since the wing exerts a force on the air to change its direction, the air must exert a force on the wing, equal in size but opposite in direction. This force manifests itself as differing air pressures at different points on the surface of the wing. A region of lower-than-normal air pressure is generated over the top surface of the wing, with a higher pressure on the bottom of the wing. (See: airfoil) These air pressure differences can be either measured directly using instrumentation, or can be calculated from the airspeed distribution using basic physical principles—including Bernoulli's Principle, which relates changes in air speed to changes in air pressure. The lower air pressure on the top of the wing generates a smaller downward force on the top of the wing than the upward force generated by the higher air pressure on the bottom of the wing. 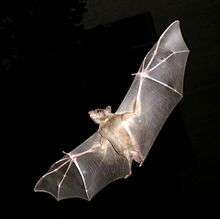 Hence, a net upward force acts on the wing. 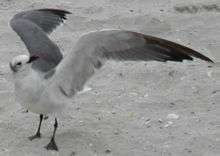 This force is called the "lift" generated by the wing. The different velocities of the air passing by the wing, the air pressure differences, the change in direction of the airflow, and the lift on the wing are intrinsically one phenomenon. It is, therefore, possible to calculate lift from any of the other three. For example, the lift can be calculated from the pressure differences, or from different velocities of the air above and below the wing, or from the total momentum change of the deflected air. Fluid dynamics offers other approaches to solving these problems—and all produce the same answers if done correctly. Given a particular wing and its velocity through the air, debates over which mathematical approach is the most convenient to use can be mistaken by novices as differences of opinion about the basic principles of flight. For a more detailed coverage see lift (force). Usually, aircraft wings have various devices, such as flaps or slats that the pilot uses to modify the shape and surface area of the wing to change its operating characteristics in flight. In 1948, Francis Rogallo invented the fully limp flexible wing, which ushered in new possibilities for aircraft. Near in time, Domina Jalbert invented flexible un-sparred ram-air airfoiled thick wings. These two new branches of wings have been since extensively studied and applied in new branches of aircraft, especially altering the personal recreational aviation landscape. A common misconception is that, to generate lift, a wing must have a longer air path across its topside compared with its underside. Wings with this shape are the norm in subsonic flight, but symmetrically shaped wings (above and below) can generate lift by using a positive angle of attack to deflect air downward. Symmetrical airfoils have higher stalling speeds than cambered airfoils of the same wing area but are used in aerobatic aircraft as they provide practical performance whether the aircraft is upright or inverted. Another example comes from sailboats, where the sail is a thin membrane with no path-length difference between one side and the other. For flight speeds near the speed of sound (transonic flight), airfoils with complex asymmetrical shapes are used to minimize the drastic increase in drag associated with airflow near the speed of sound. Such airfoils, called supercritical airfoils, are flat on top and curved on the bottom. Kites, which use a vast variety of wings. Propellers, whose blades generate lift for propulsion. The NASA Space Shuttle, which uses its wings only to glide during its descent to a runway. These types of aircraft are called spaceplanes. Structures with the same purpose as wings, but designed for use in liquid media, are generally called fins or hydrofoils, with hydrodynamics as the governing science, rather than aerodynamics. Applications of these arise in craft such as hydroplanes and submarines. Sailboats and sailing ships use both fins and wings. 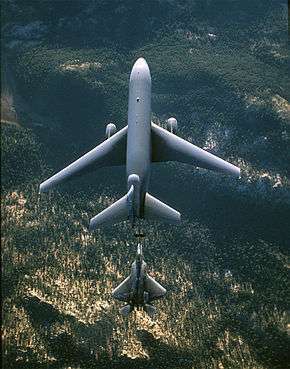 Spoilers on the upper surface to disrupt the lift and to provide additional traction to an aircraft that has just landed but is still moving. ↑ "Online Etymology Dictionary". Etymonline.com. Retrieved 2012-04-25. ↑ "Swimming". Stanford.edu. Retrieved 2012-04-25. ↑ "Navier-Stokes Equations". Grc.nasa.gov. 2012-04-16. Retrieved 2012-04-25. ↑ "If the body is shaped, moved, or inclined in such a way as to produce a net deflection or turning of the flow, the local velocity is changed in magnitude, direction, or both. Changing the velocity creates a net force on the body" "Lift from Flow Turning". NASA Glenn Research Center. Retrieved 2011-06-29. ↑ John D. Anderson, Jr. Introduction to Flight 4th ed page 271. Wikimedia Commons has media related to Wings.